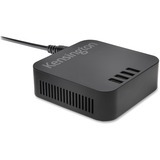 Power up to four tablets and smartphones at the same time with the 48W 4-Port USB Charger from Kensington. PowerWhiz Technology allows almost any device to be plugged into the charger because it automatically recognizes your device and gives it the fast charge possible while remaining completely circuit safe. You can mix and match any combination of devices into any of the four USB ports, and each port can carry up to 2.4 amps of power to ensure even tablets get a speedy charge. To ensure you don't have to sacrifice outlet space around your desk or in the house, the charger only needs a single wall socket to get those device batteries filled up.